“Vegan? Okay, fine…” That’s what you thought, but now you have a different question: How did the world deliver to you such joy so late in your life? You don’t even like mushrooms, but here you are gobbling them up. Tofu? That tastes like whatever it’s covered with, which is raw red pepper cheese, in this case. Glorious mixed greens offer a sense of balanced flavor. 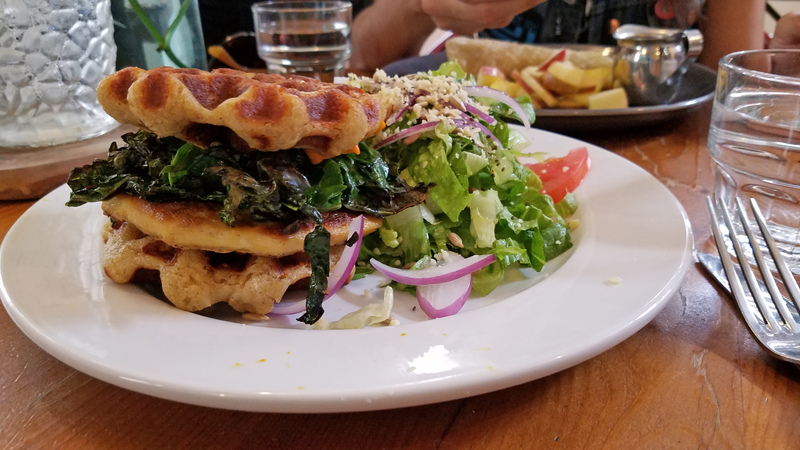 All this, held within two crisp-on-the-outside, soft-on-the-inside waffle hands, reaching out to fill your face with guilt-free nourishment. Yes. Yes, you could be vegan. You can eat this all day and every day. The new you! Vegan you! Maybe.